Zombolette | Welcome to the wonderful world of Zombolette, where complex questions of science, art, ethics, religion, relationships, and life are addressed in the most inane ways imaginable. 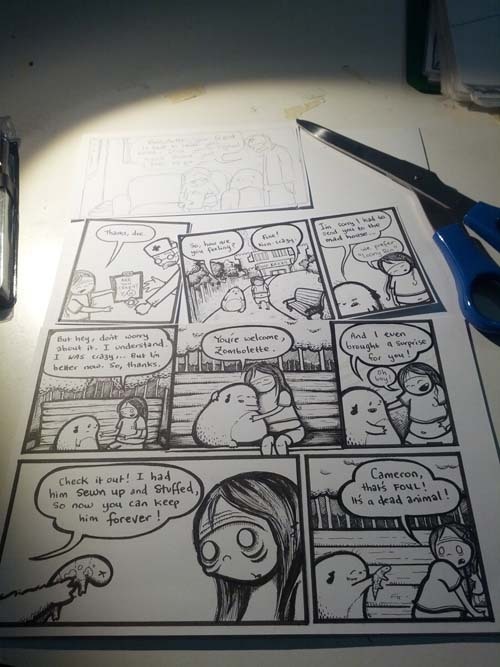 Here’s a little behind-the-scenes look at my comic-creating process, in case anyone’s interested. I love reading this kind of thing from other artists. Once I’ve come up with one of my genius story ideas, I write out a beat sheet (kind of like a list of the key points in the story). Then I write out the script, breaking it into panels and pages–a delicate process. Each page can fit maybe up to 12 panels, but it must make sense as a single page of action, and capture a specific mood and rhythm. I also try to end each page with a natural ‘rest’. My scripts are very bare, since I do all my own art–I don’t need to communicate artistic ideas with anyone else, and I flesh most of the visuals out when I’m drawing drafts rather than scripting. Maybe I would get better results by writing out some art direction, but I find this effective enough. 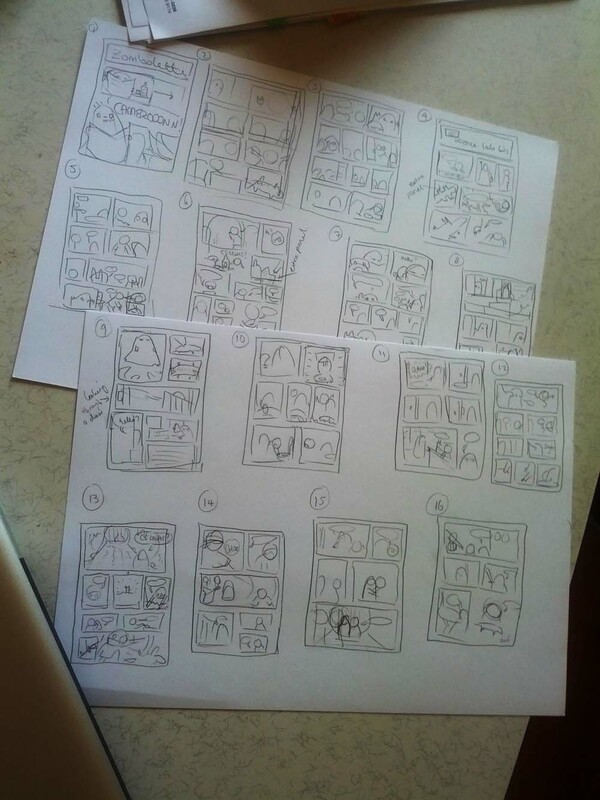 The next thing I do is make rough thumbnails of each page, to make sure everything fits, and to get an idea of how to compose the panels into a page that flows nicely. These are super crappy and rough. I never used to even draw the action in the panels at this point, I’d just sketch out where the squares were gonna go–I find drawing thumbnails super boring. This means that I spend a lot of time erasing stuff, whiting stuff out, and swearing during later stages. I know I’d save time by drafting more thoroughly… maybe this can be a new year’s resolution. Anyway, as I’m drawing thumbnails I might find that some pages are too squishy and rushed, or too empty or whatever, so the script tends to change a bit here. 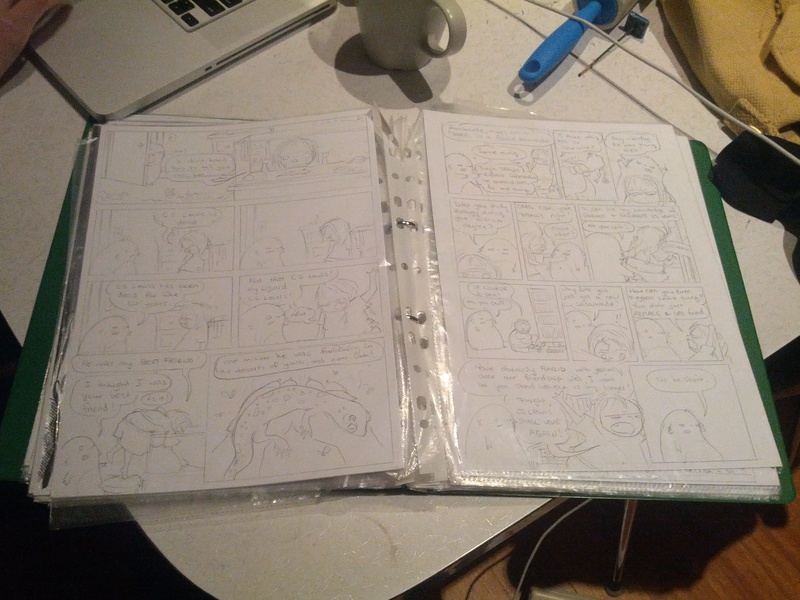 Next, I do full-sized pencil drafts of every page. I should probably do more comprehensive thumbnails, too. I’ll let you know when I’m done I guess! 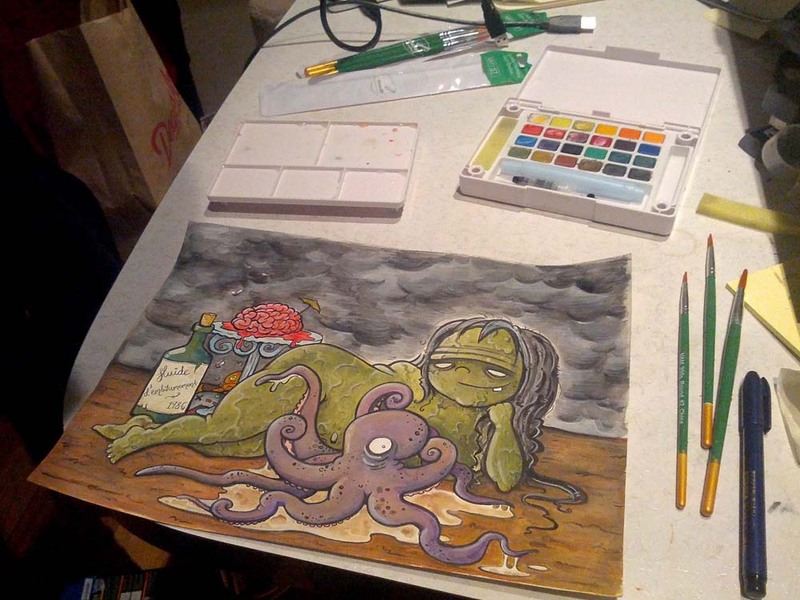 The graphic novel of Zombolette that I’m working on is going to take ages. 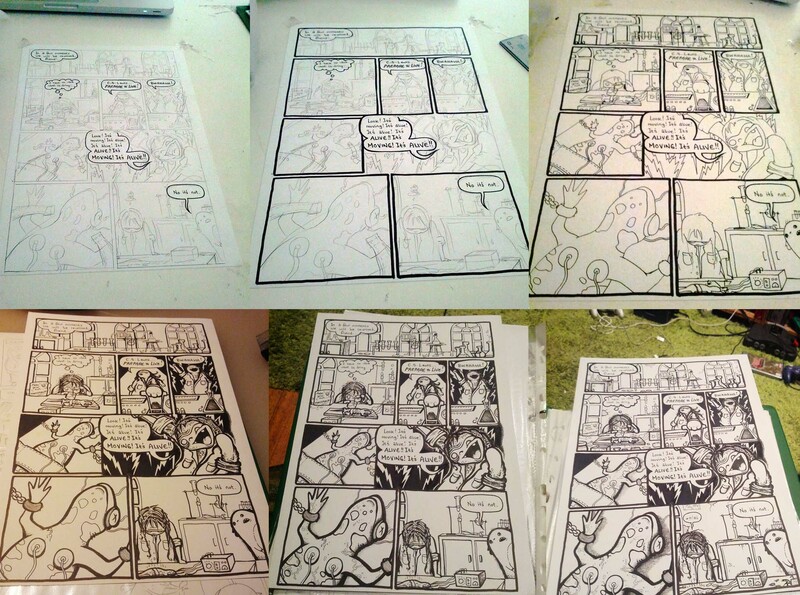 Ideally, all the inking will be done by hand (rather than digitally), and it’s going to be around 200 pages. That’s a lot of work. And I’m a lot of lazy. But there are loads of little Zombolette stories still to tell, so I’m going to try to release a single-issue Zombolette comic pretty soon. I’ve really missed drawing Z’lette and Cam and monobrows and walri and brains and bellies.